José: "Greetchen, one of the most famous trees in the Island is the ceiba tree. Have you seen one bloom? " Greetchen: "To be honest, I did see one flourish, but it was a long time ago. In my hometown, Ponce, there is a park called “La Ceiba”. José: "This month I will introduce an animation that shows when the ceiba flower flourishes. I created this animation using photos that were captured by Dr. Jose A. Mari-Mutt, who is a professor of the Department of Biology at the University of Puerto Rico, Mayagüez campus. " Ceiba flower. Presented by: :Greetchen Díaz y José Almodóvar. Photos: Dr. Mari-Mutt. Animation:José Almodóvar. Greetchen: " Great! Dr. Mari-Mutt, How did you take these pictures?" Dr. Mari-Mutt: "The photos were taken in Feruary, when a ceiba tree I have in my backyard flourished. To capture the images, I cut a bunch of flowers and placed them in a container with water. I placed my camera on a tripod and just before the flowers began to open I started taking pictures every 15 seconds. 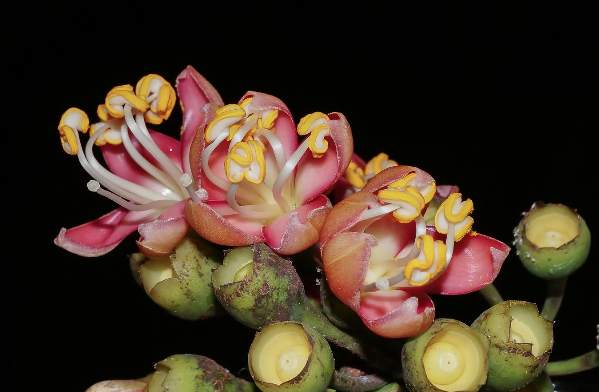 Although the ceiba flowers last only one night, the tree was blooming for several weeks." José: "I guess that to observe the bloom of this majestic ceiba tree is a unique event. What other details can you share with us on the ceiba? Dr. Mari-Mutt: "The first visitors to the flowers are bees, which come before the flowers open and then enter as soon they have a chance. The window of time to collect nectar and pollen is short because the sunset begins and the bees need light to find the way back to their hive. " Greetchen: "Are there any other visitors to this flower?" Dr. Mari-Mutt: "Yes. Shortly after bees leave the flower, the moths arrive. Then, when the flowers are wide open and the sky is dark, bats come attracted by the flower’s scent. The bats, in their eagerness to lick the nectar that accumulates at the base of the flower end with the face and chest covered with pollen! When this process is repeated in another flower, pollination happens. " José: "Interesting… Tell us, how the process ends? " Dr. Mari-Mutt: "The next day, as soon begins to dawn, the bees return searching for the remaining nectar and pollen. The cycle is repeated night after night, starting earlier or later depending on the light intensity, which is affected by the amount of clouds in the sky. "